Longer days and better weather make for more productivity in the outdoor workplace. It’s the start of the peak seasonal time for work with power access platforms. Those outdoor working at height jobs that were less frequent because of the weather are now more urgently required. One of the many advantages of using powered access platforms is to work safely at height in a variety of locations; they are multi-functional as well as flexible suiting the needs of a diverse range of industries from construction to farming. Powered access platforms are the machine of choice for many tree surgeons as they offer a speedy way to climb trees safely, lift tools and move between locations. They are used for clearing falling branches, trimming and maintaining trees in walking areas, planting new trees, and removing dead branches. The maintenance of parks, woodland and rural areas including clearing of dead leaves, fallen branches and debris provide a fitting backdrop for the daffodils and tulips. They also prepare the ground for replanting for the summer growing season. Access platforms can reach verges and embankments which need to be cleared of rotting vegetation and debris, especially in hard to reach places such as roadsides and railway sidings. After winter damage to roofs, signs, streetlights and buildings, a backlog of maintenance issues for buildings and urban areas soon builds up. Leisure centres and offices, for example, must provide safe and easy access at all times. Access platforms are ideal for tackling these small but important jobs, safely and efficiently. Access equipment, such as spider lifts, can move easily around urban areas, including through alleys and gateways, operating safely in confined spaces to carry out repairs and maintenance jobs. Gutters that have been clogged with leaves and grime can seriously affect building structure and fragile roofs. Powered access equipment provides a safe, secure working platform to carry out repairs with minimal risk to the workforce and the public. 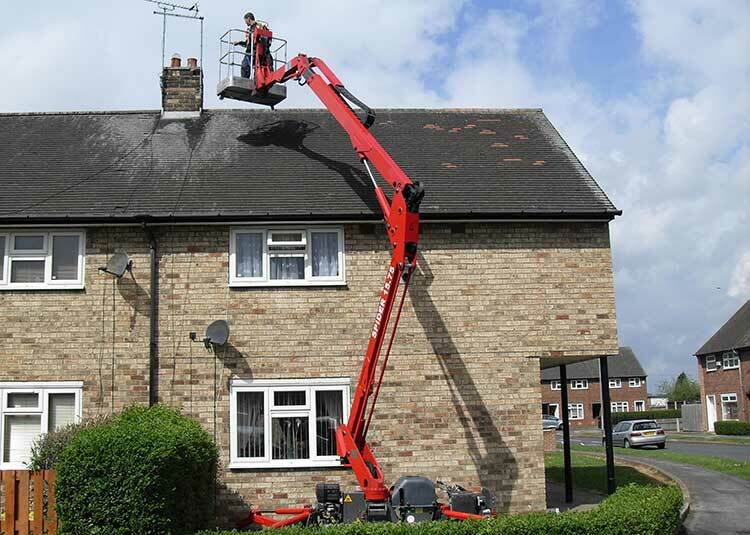 Powered access platforms are used to reach windows quickly and clean even hard to reach areas. Industrial cleaning firms use them widely in the spring and summer months. Machines such as boom lifts offer significant height and outreach to overcome obstacles and work safely at height. Graffiti removal, brick and stonework cleaning are in demand. After the winter weather powered access platforms are flexible and versatile to tackle jobs in a variety of working environments. They allow for more work to be done outdoors efficiently and effectively. A case of winter blues being swept aside ready for the joy of spring and, hopefully, sunshine! The lighter nights and warmer weather of Spring mark the start of the peak seasonal time for working at height with powered access platforms. The new season means many industries, such as construction, utilities or landscaping, are ready to tackle more complex jobs at height which are less frequent in winter months when outdoor working hours are shorter and conditions are more unpredictable. Parkland, estates and rural areas need clearing of dead leaves, fallen branches and debris, and replanting for the spring growing season. Powered access platforms are also widely used by tree surgeons as they offer a speedy way to climb trees, lift tools and move between locations. They are used for clearing falling branches, trimming and maintaining trees in walking areas, planting new trees, and removing dead branches. Winter storms cause damage to roofs, signs, streetlights and buildings and cause other maintenance issues. Access platforms are ideal for tackling these small but important jobs. Access equipment, such as spider lifts, can move easily around urban areas, including through alleys and gateways, operating safely in confined spaces. Gutters clogged with leaves and grime can seriously affect building structure and roofs if water is left to back up and access equipment offers a safe, secure platform to work on repairs from, especially if roofs are fragile. Windows cover a large percentage of modern buildings, shops and industrial units and window cleaning in winder is infrequent. 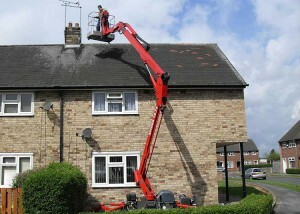 Powered access platforms are used to reach windows quickly and clean even hard to reach areas. Industrial cleaning firms use them widely in the spring and summer months. Powered access platforms are flexible and versatile to tackle jobs in a variety of working environments and spring is the start of a range of annual jobs at height which they are ideal for. In urban and rural areas they offer a stable and secure platform to lift people and tools, to clean up the debris of winter and prepare parks, gardens and urban areas for the fast growth and warmer weather of the summer months. Access platform managers play an important role in making sure the work is completed safely, efficiently and on budget. Management is sometimes the result of being self-employed or owning and business and, for others, it is a natural progression of their skills and experience as a powered access operative. Whatever route you take to management the rules are the same and the person in charge is responsible for ensuring the job runs on time and to budget without compromising health and safety of workers or anyone around the work area. Planning and organisation are the key to well managed job. Access platform managers are responsible for spotting potential hazards and taking action to avoid the causes of serious injury or even death such as falls, overtipping or entrapment. Managers have the serious responsibility of completing a risk assessment. The risk assessment should include ground conditions in all work areas and any obstructions such as overhead power lines, buildings or branches. It should be fully documented and reviewed throughout the course of the job to account for changeable conditions, like the weather. It should also include rescue contingency plans and it is the manager’s job to make sure everyone is aware of what to do if something goes wrong. A range of health and safety legislation governs the safe use of powered access platforms including the Provision and Use of Work Equipment Regulations 1998 (PUWER), Lifting Operations and Lifting Equipment Regulations 1998 (LOLER) and the Work at Height Regulations 2005. The manager should be aware of all legal requirements relating to the operation of access equipment to ensure safe working and avoid costly delays or dangerous accidents. Under UK law all access equipment operatives should also be fully trained and accredited before they work with any machine. The manager is responsible for making sure and operatives are trained and familiarised with the specific make and model they are using. Choosing the right access equipment for a specific job is essential as different makes and models are suitable for different jobs and locations. The choice of equipment will depend on a range of factors including site access, ground conditions, obstacles and mobility. Powered access platforms should be serviced every six months with a full record kept of any work or maintenance. Managers also need to allow time for pre-start checks before each job and should sign off the safe operation of the machine. To get to grips with all the specific responsibilities of being a manager there is specialist training available to progress skills to an advanced level. The industry body for powered access platforms, the International Powered Access Federation (IPAF), runs a training course tailored specifically to the needs of management level staff. The course covers all aspects of planning, supervising and managing the use of access platforms, including health and safety regulations, accident prevention and control, personal protection equipment, and pre-use checks and maintenance and is available from IPAF approved training facilities across the UK. Managing a job using powered access platforms is a serious responsibility but guidance is available to progress to the next level. The manager has the final responsibility for making sure the job runs smoothly and safely which will boost productivity, establish the company reputation and safeguard the workforce against serious injury or harm. Have you got one of these symbols below in case of access platform emergencies? 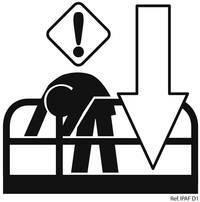 Access platform emergencies require a quick, trained response to prevent serious injury to personnel. Access platforms need clearly signposted emergency controls and an Emergency Plan in operation. These are available from the IPAF website. Clearly signposted emergency controls and a well trained and familiarised workforce will mitigate against most access platform emergencies. Quickly finding the emergency descent symbol, staying calm and using the inbuilt safety systems saves lives. As required by UK law all access platform operatives should be fully trained, whether they are working at height or on the ground. Promax Access offer a comprehensive training programme and help with your company Emergency Plan. The Emergency Plan is an essential part of the Risk Assessment carried out before working at height is undertaken. It details various emergency situations and the proposed action to be taken. • Site management have contacted the competent and authorised service engineer listed in the rescue plan, to report failure of normal and auxiliary lowering systems and request engineering assistance. If after inspection by the competent engineering assistance, it is not possible to effect a timely repair to allow the machine to be brought to the ground safely, senior site management should be contacted for permission to carry out mid-air rescue. Where the competent engineering assistance is not readily available and an immediate risk exists to the health and safety of any of the occupants from remaining in the elevated basket until an engineer can attend, then senior site management should be contacted for permission to carry out mid-air rescue. A. Rescue using another MEWP should only be performed once a site-specific risk assessment has been carried out and a specific access platform emergencies plan has been documented and approved by senior management. B. The rescue machine must be positioned so as to enable the rescue procedure to be carried out without compromising the safety of any personnel involved in the rescue procedure. D. Where reasonably practicable, precautions should be taken to prevent inadvertent movement of both platforms during the transfer. E. The person being rescued (transferred from basket to basket) should wear a full body harness with an adjustable lanyard – the lanyard should be attached to the anchor point on the rescue machine before transfer takes place. F. Care must be taken not to overload the rescue machine during transfer. This may mean making more than one journey to complete the rescue. Further guidance on mid-air rescue can be found in ISO 18893:2014 – 6.1.2.8. Whatever the operating scenario, it is vital that the access equipment is in full working order following pre-start checks and that all operators are familiarised with the specific make and model being used and its safety controls.